Patience comes first. Know first of all that whatever hardship you may have to endure is but temporary. Know that the path of man is justice. Always behave correctly. Do not fall prey to avarice, indulgence, or egoism. Think of sorrow and hate as something natural and reach the enlightenment that they are gifts from the Gods. When you can see and feel this gift from the Gods then you will be able to see a glimpse of a miracle. Seek fudoshin. Never stray from the path of faith (the spirit), nor that of budo; be ambitious in the ways of both pen and sword. Dojo Kun transmitted to Michael Schjerling, by Soke Dr. Masaaki Hatsumi an auspicious day in March 2011, 2 weeks after the dissaster at Fukushima. The dojo kun is from a document written by the 33rd Grandmaster of the Togakure ryu. 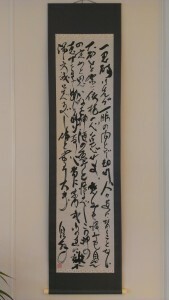 Its titel is “Precepts of Perseverance in the Martial Ways” and it contains a set of guiding principles drawn up by the 32nd Grandmaster, Toda Shinryuuken. In just five articles, it manages to encompas the essence of Budo and og Ninjutsu. There are more translations of this in the various books from Hatsumi Soke. The below translation is just one of them. You should read between the lines and find your own understanding for your practice. Also know that the english translation in Sokes books are often missing some thing and Soke changes the words and kanji from time to time as well.